We're so confident you'll love the iScoot Blaze, we give all our customers a 30 day no quibble trial so you get all your money back without any questions if you're not 100% satisfied with the scooter. The scooter uses the 'tilt n turn' steering mechanism and is ideal for ages 5-12 with a weight limit of 50kg. Adjustable handle bars from 72.5cm to 86.5cm will allow your child to scoot for years. The iScoot Blaze is very popular for the school run, no more hanging back dragging their feet - now you will be running to keep up!! The iScoot Blaze has an easy to use twist and turn patented folding mechanism and can fit in the back of your car, on your buggy or the corner of a cafe. 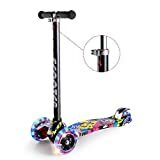 This is the sturdiest scooter we've ever built and that's why we guarantee that kids will love this or you get your money back ! Great when one child is still in the buggy and the other is not quite ready to walk. 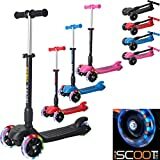 100% SATISFACTION GUARANTEE - We're so confident you'll love the iScoot X10 Neon we give all our customers a 30 day no quibble trial so you get all your money back without any questions if you're not 100% satisfied with the scooter. 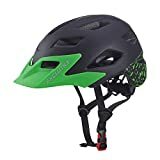 The X10 Neon is Ideal for ages 5-12 with a weight limit of 50kg. 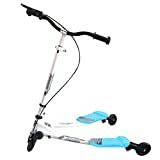 Adjustable handle bars from 72cm to 82cm will allow your child to scoot for years. 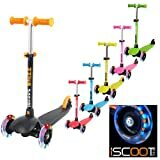 EASY SCHOOL RUNS - The iScoot X10 Neon with flashing Pink LED Wheels is very popular for the school run, no more hanging back dragging their feet - now you will be running to keep up!! The iScoot X10 has an easy to use standard shaft turning mechanism and can fit in the back of your car, on your buggy or the corner of a cafe. 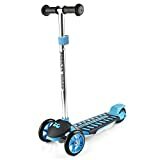 BALANCE - This is the sturdiest 2 wheel scooter we've ever built and that's why we guarantee that kids will love this or you get your money back ! Great when one child is still in the buggy and the other is not quite ready to walk. 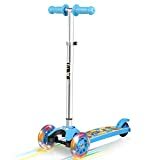 LARGE LED WHEELS - The 125mm LED wheels means Children can get moving on the iScoot X10 Neon and gain confidence with speed and balance, from the age 5 years and above. The iScoot X10 Neon will have kids 'surfing' the pavements in no time. We're so confident you'll love the iScoot Whizz we give all our customers a 30 day no quibble trial so you get all your money back without any questions if you're not 100% satisfied with the scooter. The scooter uses the 'tilt n turn' steering mechanism and is ideal for ages 3-5 with a weight limit of 30kg. 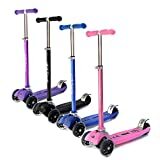 Adjustable handle bars from 55cm to 69cm will allow your child to scoot for years. The iScoot Whizz is very popular for the school run, no more hanging back dragging their feet - now you will be running to keep up!! The iScoot Whizz has an easy to use push and remove handle bar mechanism and can fit in the back of your car, on your buggy or the corner of a cafe. 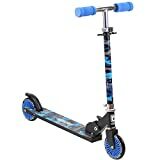 This is the sturdiest scooter we've ever built and that's why we guarantee that kids will love this or you get your money back ! Great when one child is still in the buggy and the other is not quite ready to walk. 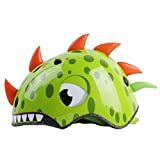 The iScoot has LED wheels so when kids are whizzing away the wheels light up and no batteries are required. The joystick steering makes it easy to ride and get around bends without any accidents! The brake on the back is easily managed by the child and soon they have confidence being in full control of this great scooter. 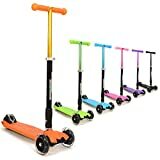 The whole handle and stalk can be removed easily with a push of a button if you need to store or transport the scooter. 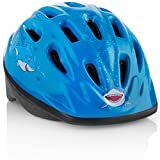 Minimum Age 3+ - Recommended For Ages 5 - 10 Years Old. Easyglide tilt- to-turn joystick steering system, making for a more fun scooting experience! Complete with four of our signature Spin & Flash PU LED wheels (double stacked single rear wheel), add a burst of colour to every scoot. The lightweight design and foldable handlebars make the RGS-2 easy to carry and convenient to store when not in use. 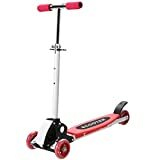 2 adjustable height settings to suit a range of ages, starting at 58cm and moving to 85cm so the scooter can grow with its rider. 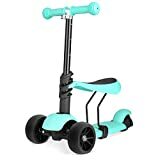 This awesome scooter is specially designed and exclusively manufactured for 3style ScootersÂ and available in Blue, Pink, Green, Orange, Purple and Black. 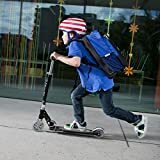 LA Sports Stage 2 foldable scooter is fun and easy to use for both children and parents. 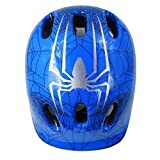 It has an aluminium frame that is coated in durable plastic making it long lasting. 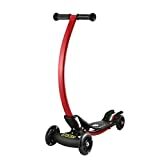 The large range of handle bar settings on this scooter means it will grow with your child, saving the need for regular replacements. The tilt/lean kickboard steering gives you and your child confidence and makes it easy to control. 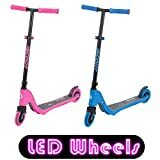 Its 3 LED flashing wheels add fun and provide safety during the winter ride home from school. The quick release T bar allows it to be folded easily especially for parents to carry or put into the car. All this without getting muddy hands! Adjustable handle bar with five different settings at heights 62cm, 75cm, 80cm, 85cm and 90cm. Foldable size - 62 x 27.5 x 20.5cm Wheel Size : Front 120mm, Rear 100mm. Also features a rear break. Tested and certified to EN 14619 Class A European Safety Standards.